Happy Wednesday! 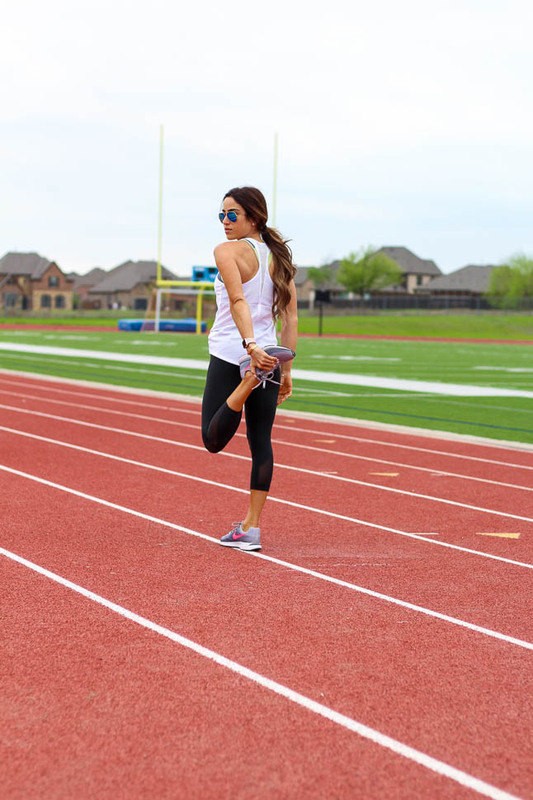 We are so excited to be back with another fitness post. We have been getting SO many requests to share our workouts and diet, etc. In case you missed any of our fitness posts, you can check them all out here. We are going to be sharing what we eat/what our diet consists of, but before we get into that we are going to share a little more about this super versatile workout outfit from Lolë . We love what they stand for (Live Out Loud Every Day). These crops also have a really cool feature in them, COOLMAX ® ALL SEASON, which keeps your body cooler on the hot runs, but also keeps you warmer on chillier days. How cool is that?! This white tank comes in 5 colors and has moisture-wicking and also has antimicrobial protection. Besides all of these amazing features, we love the fit of it, and how the back has a mesh racerback. We threw on this hooded jacket for cooler temps (comes in 5 colors and is SO soft and cozy!) And, now for more about what we eat! It is probably one of our most asked questions (besides what our workouts are, haha). We honestly eat very plain and boring most of the time. We have tracked macros and calories in the past, but it is honestly just too much for us, and causes too much anxiety. You have to ultimately figure out what works best for you, and we do think it is a great place to start if you’re wanting to stay on track or get an idea of how much/what you’re eating/keep yourself accountable! If you do decide you want to track your calories or macros, we suggest using MyFitnessPal and/or calculate your macros using a website like this one. Since we don’t really track our calories, it is hard to say how much we typically eat in a day, but our guess would be between 1800-2200 calories. Don’t let that number make you think you should eat any less or more than you already are;)! Instead of tracking calories or macros, we definitely do pay close attention to nutrition labels and ingredients, and portion sizes. It isn’t always necessarily what you’re eating, but more how much of it you’re eating. For example, things like nuts, chips, popcorn, etc, are not bad for you at all, but if you eat the whole bag’s worth, instead of a cup, that changes a lot. Green tea with stevia and lemon juice to drink! If we aren’t at the gym, we will snack on some GG crackers, raw almonds, or some cut up vegetables like carrots or cucumbers with some hummus or this Greek yogurt ranch dressing. about 3-4 oz grilled chicken/rotisserie chicken (bought at Sam’s club or any grocery store) with a salad made with romaine lettuce/spring mix with tomatoes, cucumbers, onions, mushrooms, carrots, etc. For dressing, we use balsamic vinegar or red wine vinegar and salt and pepper. We also use mustard on our salads. SO good! **Again this is not exact, but to get an idea! This is a great post! Thanks for sharing this. I love your outfit. It looks really comfy and perfect for my daily workout routine. Gosh you both look amazing. I’m dying to get a body like that. Nice outfits too! Thanks so much for sharing this article. I really like your diet which is high in protein. Me and my husband goes to the gym like 5 times a week and I believe that we do need this diet too so that we can build more muscles. Great read!